Migratory birds have made their thousand-mile flights for millennia, but we are just now learning to map their mesmerizing journeys. To conserve energy, migrating birds often take direct—and dangerous—routes, which can expose them to storms, predators, and disorientation from perilous navigation conditions. Migrations that cut across deserts or open water are especially risky. On rare occasions, a storm front or band of rain intersects the birds, killing thousands and forcing an entire sky full of them to stop at the first land they encounter. Birdwatchers revel in these events (known as fallouts). 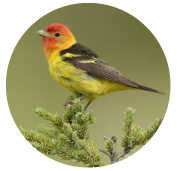 Colorful warblers, orioles, and tanagers decorate every bush and provide eye-level views as they forage ravenously to recover from the difficult flight. Human activity over the past century has increased the hazards. Habitat loss, pesticides, and hunting or trapping on stopover grounds have taken major tolls on migrating birds. The bright lights of cities can be particularly disorienting to migrant birds, many of which fly at night, resulting in fatal collisions with buildings and radio towers. The reward for all these risks is that migration allows birds to follow food resources around the planet. The arrival of fresh spring leaves—or leaf out—sweeps in a green wave from low to high latitudes in the Northern Hemisphere. The leaves recede in autumn. Most bird migration in this hemisphere is closely tied to this green wave, which brings an abundance of insects, especially caterpillars. The plentiful fodder fuels a busy season of singing, defending territory, and mating. Birds are able to raise their young and fatten up before the return southward. Roughly half of the world’s bird species migrate. Out of that multitude, these seven illustrate the variety of paths that birds can take during migration in the Western Hemisphere—evoking the waves of birds that flow over and around us with each passing season. 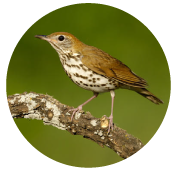 The song of the wood thrush is one of the most iconic sounds of eastern hardwood forests in the United States and southern Canada. As an insectivorous forest bird, its northward movements closely follow the green wave. But the destruction and fragmentation of forests has led to a decline in its population. The wood thrush belongs to a suite of birds known as neotropical migrants. 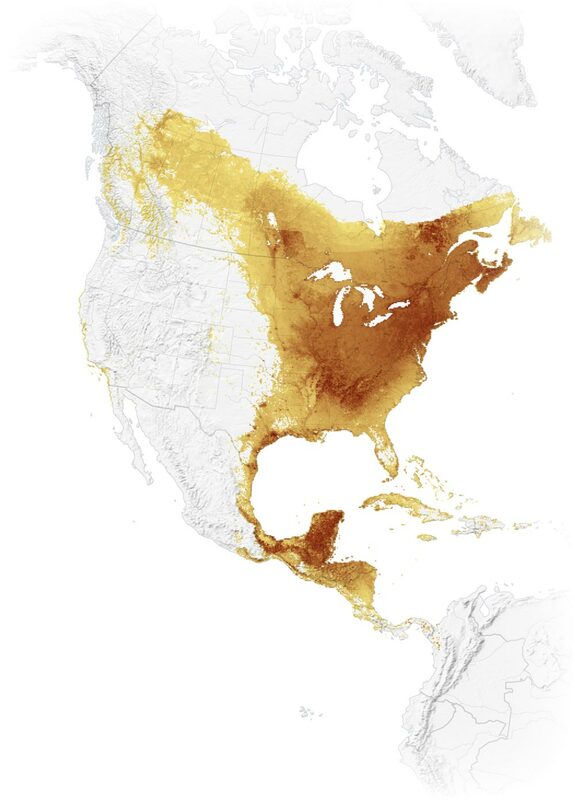 Eastern neotropical migrants breed in Canada and the eastern U.S.; they migrate east of the Rocky Mountains. Western species breed and migrate from the Rockies to the west coast. Eastern species have longer migrations, fueled in part by their insect-rich breeding grounds. Birds observed within an hour at 7 a.m.
Neotropical migrants, including the wood thrush, overwinter in the New World tropics. Wood thrushes save energy with shortcuts across the Gulf of Mexico. This is a risky flight, but consistent tailwinds make it efficient—as long as a surprise rainstorm doesn’t interfere. The flight usually takes less than a day. If all goes well, most of the birds fly directly to inland forests in the southern Appalachians or central Alabama. By late May the entire population of wood thrushes has vacated tropical wintering areas and are at their breeding grounds. This is typical for most neotropical migrants: The population completely shifts between winter and summer. In late September the earliest migrants arrive back at their wintering grounds, while most of the population remains in the north. Over the next month, the rest of the thrush population will fatten up and head south across the Gulf of Mexico. By mid-November wood thrushes have followed the green wave back south to their wintering grounds, which cover a much smaller range than the breeding areas. With the birds packed into this smaller region, the species is even more vulnerable to habitat loss in the tropics than in northern breeding areas. 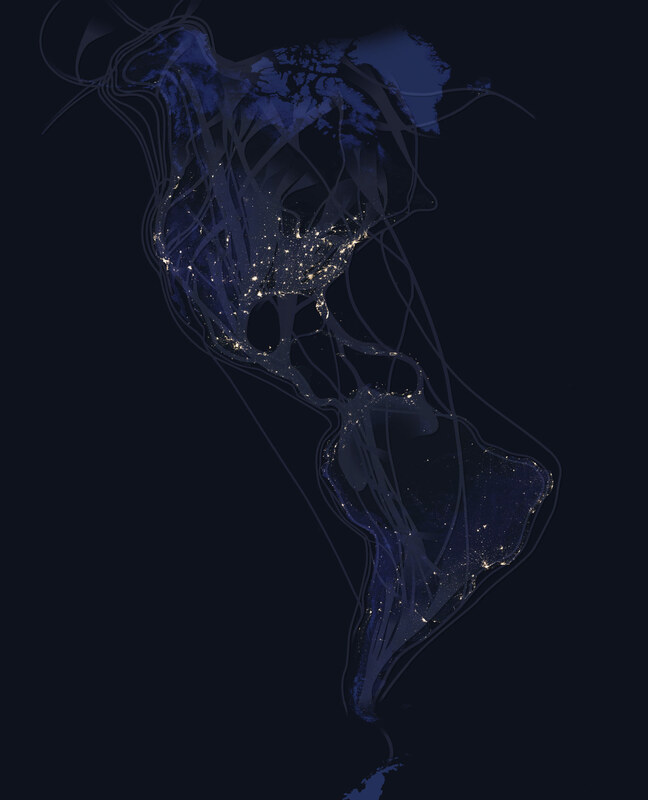 These animations are based on models of bird abundance for the Western Hemisphere created by experts at the Cornell Lab of Ornithology. 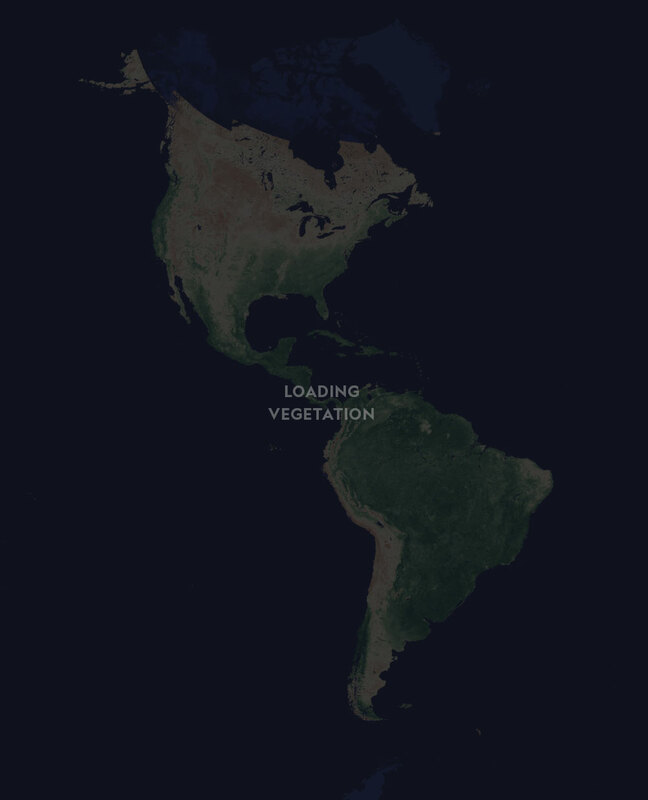 The models incorporate satellite information on habitats as well as data from eBird, a free online citizen science project that collects birdwatchers’ observations of species around the world. 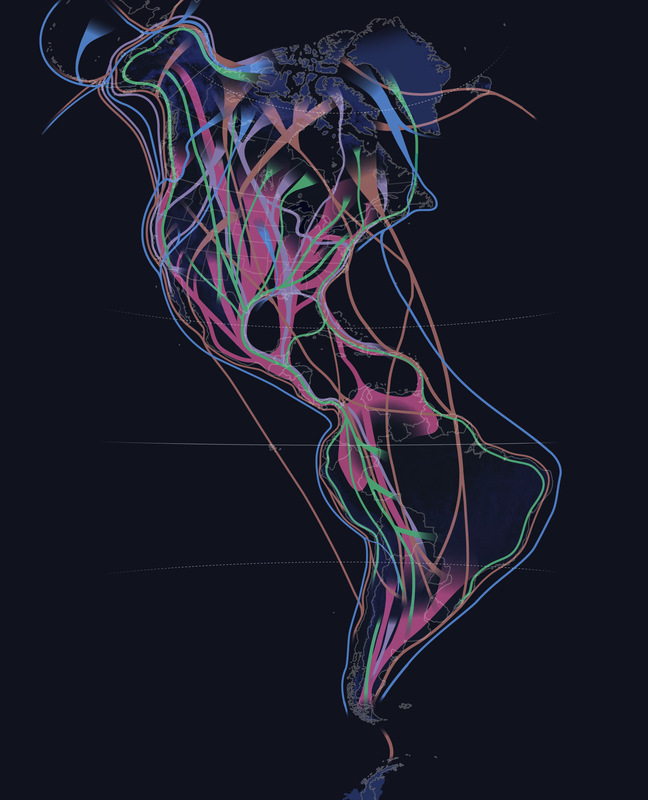 We animated these models to visualize a representative year of breeding, migration, and wintering. Male western tanagers are a striking riot of color, lighting up western pine forests with their bright yellow-and-black bodies and the reddish wash on their heads. These songbirds winter on the Pacific slope of Middle America, from western Mexico to the drier Pacific forests of Costa Rica. These drier forests match the western forests of the United States, where the birds breed. 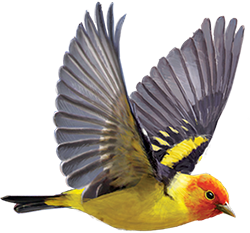 As with most neotropical migrants, the western tanager follows the wave of greenery north from its wintering grounds. Areas along the Pacific warm up and “green up” earlier than on the East Coast. 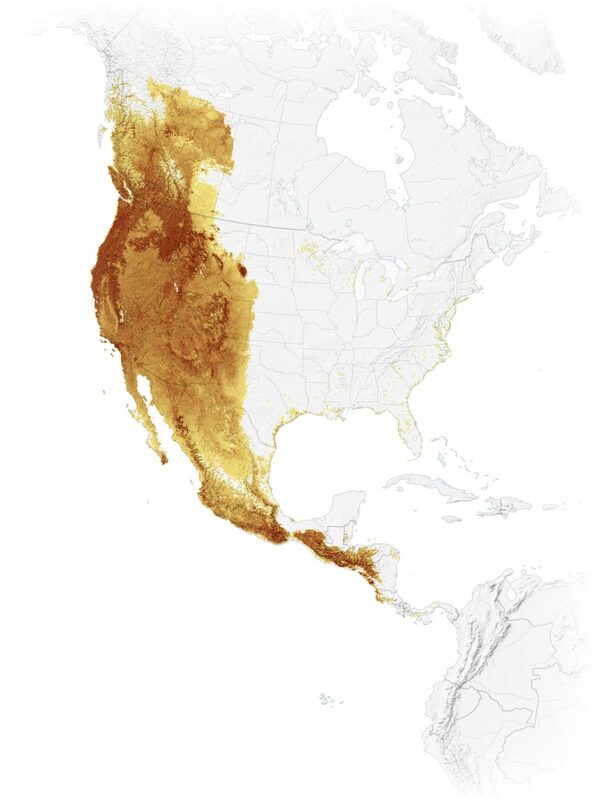 Tanagers push into California, Oregon, and Washington as early as April. Over the month that follows, higher and drier climates in the western interior release winter's grip and begin to leaf out. Western tanagers can be seen streaming through deserts and mountain passes and stopping off at oases and city parks to drink and refuel. In mid-June western tanagers are focused on breeding, which they do in forests across the West, including areas where only the high mountains are moist enough to support woods. Many of the forests dry out as the summer gets hotter, and food and water becomes scarce. In what is called a “molt migration,” some tanagers leave dried-out breeding areas to pursue the secondary “green wave” created by monsoon rains in the southwestern deserts. The rich insect food available there allows the birds to molt a new set of body feathers. The tanagers will need these fresh feathers for the next leg of their migration. By late September fall migration is under way, with the first birds arriving at their wintering grounds. 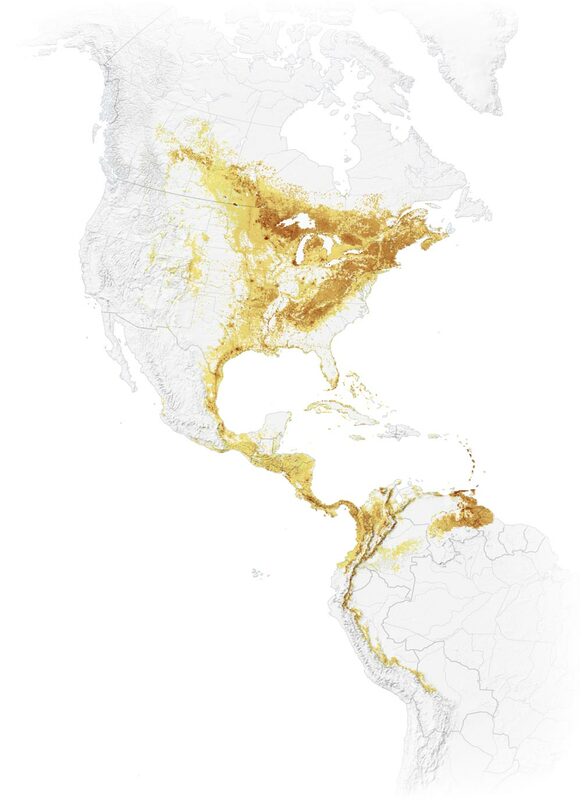 Migration is complete by late October or early November, with western tanagers and other western neotropical migrants filling in the drier Pacific slope forests of Central America, while wood thrushes and other eastern neotropical migrants populate the more humid Caribbean slope forests. 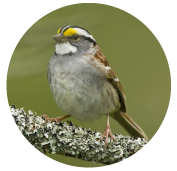 Unlike neotropical migrants, white-throated sparrows and similar species migrate shorter distances within the temperate zone. These birds can shift their diets from protein-rich insects in the summer months to seeds or fruits during the winter. They are regular visitors to winter bird feeders in the eastern United States. The winter range of the white-throated sparrow covers most of the eastern United States south of areas that receive regular heavy snowfall. Although they winter farther north than neotropical migrants like the wood thrush, white-throated sparrows migrate at the same time, following the green wave. Their entire population departs its winter areas in April and May. Breeding and wintering grounds may be just a few hundred miles apart. The Adirondack Mountains in northeastern New York, for example, are an important breeding area for white-throated sparrows, but the birds skirt the region in winter. The magnolia warbler is an eastern neotropical migrant. It breeds in northern evergreen forests across Canada, as well as higher elevations in the Northeast and Appalachians. Despite its name, it is much more associated with spruce trees than magnolia trees. Like most small songbirds—including the white-throated sparrow, western tanager, and wood thrush—the magnolia warbler is primarily a nocturnal migrant. These migrations show up on weather radar. Artificial lights are proving to be a major hazard to these species, since the city lights attract birds, placing them at risk for collisions with man-made structures and interfering with their navigational systems. The magnolia warbler overwinters from eastern Mexico to southern Central America. It is abundant in the Maya forest of the Yucatán Peninsula, a critical area for many species. The magnolia warbler embarks on an overnight flight across the Gulf of Mexico that lasts until at least the afternoon of the following day. A few of the more tired birds stop off on the immediate Gulf Coast to rest and refuel. The concentrating effect of urban lights leads some of these birds to stop in city parks. Efforts to reduce artificial light are helping birds, according to a study of the annual Tribute in Light memorial to 9/11 in New York City. 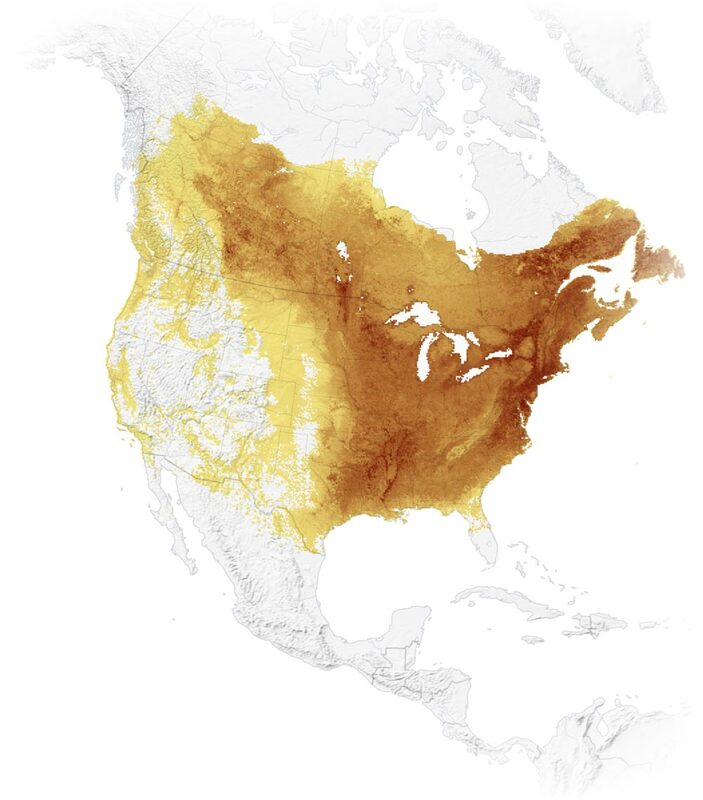 The magnolia warbler’s summer breeding range covers most of the boreal forest of Canada as well as the evergreen forests of the Northeastern U.S. The boreal forest, which remains largely intact, supports three billion to five billion birds. Even so, it is increasingly at risk from development and exploitation for natural resources like gas and oil. Healthy forest habitats in coastal areas—especially scrubby thickets and live oak cheniers—are very important for migrating birds because it’s where they rest before and after crossing the Gulf of Mexico, and where they return if they encounter difficult conditions over the water. By early November magnolia warblers are back at their wintering grounds. The entire population packs into a winter area that is just a tenth the size of the broad swath of North America that makes up its breeding range. 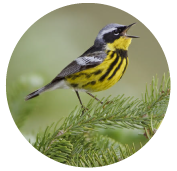 Acre for acre, loss of wintering habitat could harm 10 times more magnolia warblers than loss of breeding areas. The fork-tailed flycatcher is one of the most distinctive birds on the planet. The male’s strikingly long tail makes him vulnerable to predators and less efficient in flight—and signals to females that he is strong enough to overcome those difficulties. A creature of the Southern Hemisphere, the fork-tailed flycatcher heads south for the austral summer. Millions of forktails undertake migrations of thousands of miles within South America. The movements of most austral (or southern) migrants are very poorly known, with the routes and primary wintering areas for many species only now being discovered. 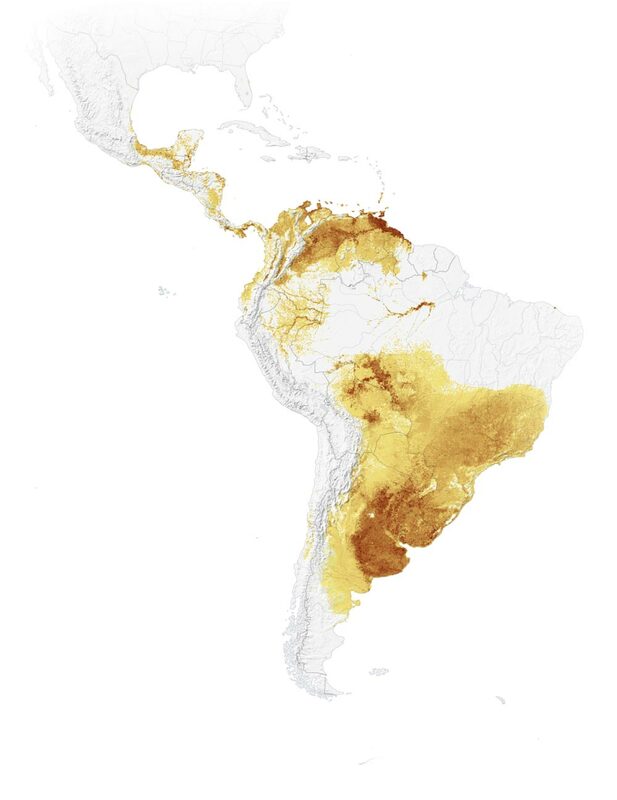 Although South America hosts more bird species than any other continent—3,381 species, or 32 percent of the birds in the world—the relative proportion of migrants is much lower than in North America. 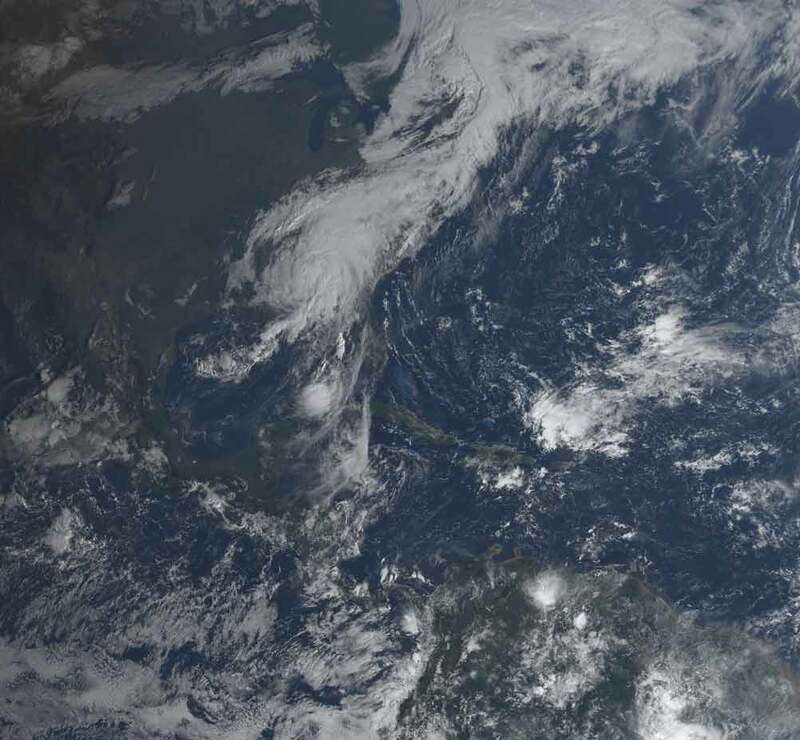 Scientists point to the shape of the continents and the amount of temperate landmass south of the tropics as the reason why. 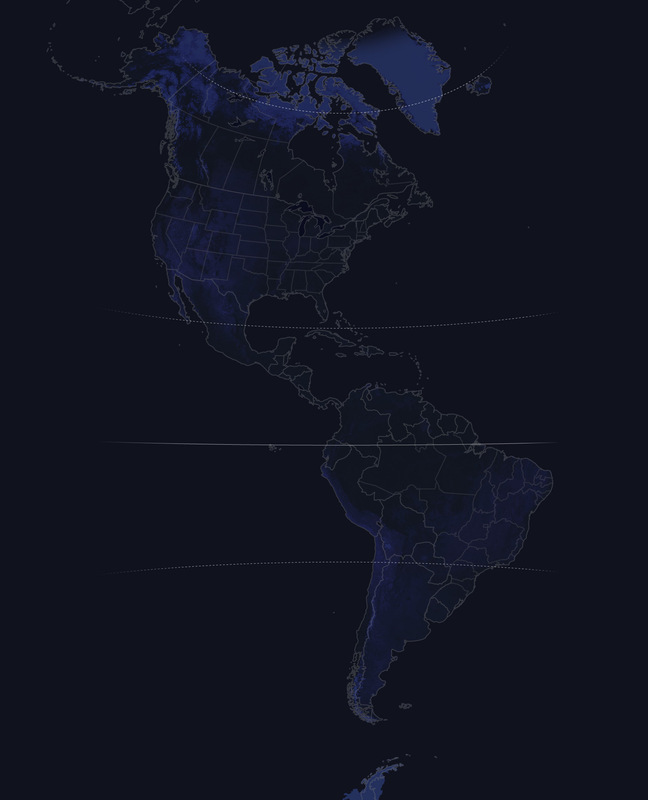 At latitudes greater than 30 degrees, North America has almost six times more landmass than South America—and three times more migratory species. The seasons are reversed in the Northern and Southern Hemispheres, but the green wave moves in the same direction at the same time in both hemispheres (north from February to March and south from August to November). So do the birds. In the spring (the austral fall), the flycatchers make a northward flight to western Amazonia. The fork-tailed flycatchers travel north and east to the insect-rich marshes of northern Venezuela known as the Llanos. 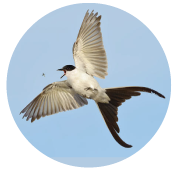 The exact path of fork-tailed flycatchers was discovered within the past decade, when lightweight tracking devices were used to follow the trail of individuals nesting near Buenos Aires. They revealed a clockwise circuit of South America. Although the Amazon rain forest is a rich area for bird diversity, fork-tailed flycatchers mostly fly right over it. Many prefer to stop in southern Brazil, where the grassy savannas provide good breeding habitat. Those heading further south to Paraguay or northern Argentina may pause to fuel up at the Pantanal wetlands in western Brazil. 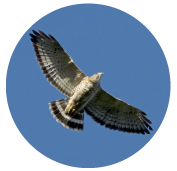 The broad-winged hawk is a forest hawk. These solitary birds hunt from perches inside forests, overwinter in Central and South America, and breed in northern forests from the Appalachians to central Canada. They are one of the few raptors that migrate south in large groups, covering amazing distances and taking advantage of rising air currents to aid their migration from Canada to South America. While most of the small land birds above migrate at night and flap nearly continuously on their migrations, larger, broad-winged species employ very different strategies. Facing little risk of predation, these birds travel by day to take advantage of natural patterns of rising air. Broad-winged hawks stick to land during migration. Soaring birds that rely on rising air currents will avoid water crossings whenever possible. Because broad-winged hawks fly over land, the continent's entire population funnels through narrow migration points in both spring and fall. In Veracruz, Mexico, over a million hawks can be counted in a single fall season; a single day in late September and early October could see counts of hundreds of thousands. Soaring birds move along ridges with north to south orientations, which get updrafts from westerly winds. Hawks can fly south for hours at a time without flapping their wings; the rising air provides the lift they need. Migration is all about minimizing the use of energy and covering ground in the right direction. All birds, but especially soaring birds, risk drifting off course. When strong northwest winds occur in the fall, a number of hawks get blown close to the coast, where they fight hard to avoid sailing over the ocean. Younger birds are more at risk from this wind drift and also more likely to migrate late. For this reason immature birds tend to end up in coastal areas in October. Each year some migrants down the East Coast end up spending the winter in the forests of southern Florida. These mostly young birds seem to get trapped by the water on three sides and the inhospitable cold to the north. Shorebirds often migrate very long distances. Although they are very efficient fliers, they need to rest and refuel for long jumps in their migrations. Greater yellowlegs forage on mudflats, flooded fields, salt marshes, and the margins of ponds, where they eat small invertebrates and fish. Since shorebirds migrate so far, having reliable stopover areas to rebuild fat reserves is important. Greater yellowlegs occur in small groups or flocks of up to several hundred birds. The winter range of greater yellowlegs spans most of the Western Hemisphere—or at least those areas where fresh water doesn’t freeze. They concentrate in places with lots of standing freshwater—the Pampas of Argentina, Texas' coastal plain, and California's Central Valley—or brackish marshes such as those along the U.S. East Coast or coastal Peru and Chile. By early March greater yellowlegs are moving up through the Midwestern United States, where frozen landscapes are melting and spring rains create wet fields, flooding rivers, and thawed ponds. Yellowlegs and other shorebirds fuel up along the Mississippi River Valley, Nebraska's Rainwater Basin, and other wet areas for the long flight to the boreal forest. Most shorebirds jump from one staging area to the next during their spring and fall migrations. Other species use this strategy too, but shorebirds are more obvious since they concentrate in small areas. In June most yellowlegs are in breeding grounds in central Canada, but a minority—the immature birds and those that are unhealthy—will stay in wintering grounds, such as coastal South America and the Atlantic coast of the U.S., for the duration of the summer. Research indicates that these oversummering birds have abnormally high parasite loads, which is one of the chief indicators of reduced health. Most shorebirds have just one chance to pull off a brood of young during the short period without frost in the Arctic and subarctic. Unsuccessful breeders return south early—with some yellowlegs heading south by late June. Yellowlegs in the east concentrate in the marshes and mudflats of James Bay, Canada, which is proving to be an important staging area for many species of shorebirds. They put on fat there for the long flight to South America. 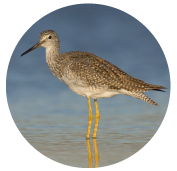 The shortest route from the yellowlegs’ breeding grounds to their wintering grounds in eastern South America is straight out over the ocean. As strong fliers, the birds can handle this with sufficient fat reserves, but the trip is still risky. They fly during hurricane season and are vulnerable to hunters if they stop to rest at Caribbean islands such as Guadeloupe or Barbados. This project was made possible with support from the National Geographic Society.